Of all Scotland's islands none casts its spell quite as dramatically as the Isle of Skye. Celebrated in song and story, Eilean a'Cheo is a place of astonishing natural beauty and attracts climbers and walkers from all over the world. The 70-mile long Skye Trail connects two of the island's most extraordinary landscapes; the world-famous Cuillin, the most rugged mountain range in Britain, and the Trotternish ridge, a rolling escarpment of basalt hills that look over the sea to the tumbled landscapes of mainland Scotland. 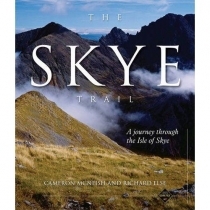 This long walk through the island, the 'Skitis' of the Celtic world, follows ancient byways, cattle drovers' routes, mountain footpaths and an old railway line, through a land where the first inhabitants sensed the presence of their gods in every nook and cranny, on every hill and crag, in every corrie and loch. Landscape and weather and an affinity with wild nature made up the very fabric of their lives.